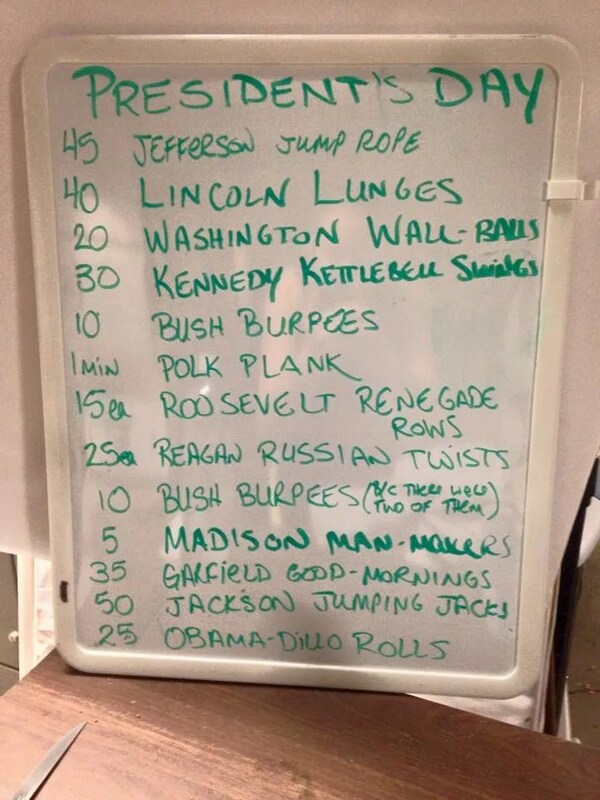 I was off work today but just “had” to come in for SMF Bootcamp for our President’s Day workout! I guess I should reiterate how much ridiculous amounts of fun I have creating themed workouts. But it wasn’t just the workout. I brought my supplies tonight and together we made med balls and kettlebells. That’s right. I MADE kettlebells. They are super light, only 17 lbs, and I don’t trust them that well to do american kb swings, but they are PERFECT for Russian swings, single leg deadlifts, single arm kb swings, and probably a whole slew of other fun activities I’ll dream up! They aren’t pretty like my med balls, but they are functional and that’s what matters! Especially when doing Kennedy Kettlebell Swings. I love that I’m reusing items that would normally just get tossed out and giving them another life. I made some makeshift weights out of kitty litter containers. I’ve got some boat fenders that we aren’t using anymore to make some sand bags that we can clean or hoist to our shoulder, or carry on our backs for squats and military sprints. And I’m constantly on the lookout for other ways to create exercises I love to hate while on a budget and reducing waste. If you have any ideas, shoot them my way. Especially ideas for pull-ups and pull-up resistance bands.